We Provide Table Tennis Rackets from STAG/ GKI/ BUTTERFLY/ STIGA/ JOOLA/ DONIC, etc to suits all budgets & level of play. Prices on Request. We Provide Table Tennis Balls. Prices on Request. 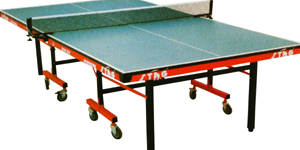 We Provide Table Tennis Tables. Prices on Request. N/Wt : 59 Kgs., G/Wt. : 66 Kgs. N/Wt : 95 Kgs., G/Wt. : 102 Kgs. Recommended for Club level & Schools. N/Wt : 96 Kgs., G/Wt. : 103 Kgs. Recommended for Tournaments at Club, District & State levels. N/Wt : 117 Kgs., G/Wt. : 125 Kgs. Recommended for National & International Competitions. N/Wt : 128 Kgs., G/Wt. : 135 Kgs. 25mm thick, pre-laminated particle Board. 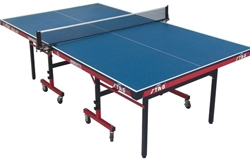 We Provide Table Tennis Other Accessories. Prices on Request.